As homes grow smaller, families are getting larger. With in-law suites becoming a popular feature in new homes and children moving back home after college, the need for more bedrooms is becoming a common problem. Other homeowners may want another source of income and have unused space. If family members are moving in, it gives them their own space while staying close. If you plan to rent out the space, it’s separated from the main house and gives the tenant and you both privacy. You may want to jump straight into your conversion, but planning is a necessary step when it comes to any home renovation. Without the proper considerations, your project can quickly become more complicated than you originally thought. We outlined the three biggest things to think about when planning a garage conversion. Many homeowners go back and forth about the benefits and drawbacks of attached and detached garages. While they have the same basic shape, the plans for your garage will develop very differently. Attached garages are more commonly found in areas that have all four seasons or have a lot of rain. It keeps the homeowner from having to walk outside in poor weather. When looking to turn you garage loft into an apartment, an attached garage may be easier. Because it’s considered part of the main house, it’s not going to require extensive rewiring or plumbing to bring it up to a livable standard. This may also mean a cheaper renovation. Detached garages are popular in regions that have moderate to warm climates all year around. It creates more of a standalone living space. Keeping the garage detached from the house is a better option for homeowners who are looking to rent out their garage apartment for extra income. The right floorplan will help you maximize square footage and still create a comfortable living space. When building a garage loft apartment, you’ll have less available square footage than you would have in a full house renovation. This simply means you’ll have to be a little more creative when it comes to your apartment’s layout. One of the most popular ways to maximize your loft style home is to utilize an open floorplan. Not only will this highlight unique architectural elements, but it also eliminates interior walls that take up space. The openness makes can make your loft feel much larger than it actually is. When deciding to pursue any kind of construction or alterations to a current structure, you will need to visit your local municipality to ensure that everything in the project is safe and legal. Bring the full plans for your new loft apartment so they know the full extent of your project. This ensure that you are completely covered and won’t have surprise fines later. Not only does your proposed renovation need to meet local standards, but you will also want to design the apartment to meet building code. Building code consists of a large number of safety standards that apply to almost every category of construction. Meeting building code is particularly important if you plan to rent out your garage loft apartment. Legally, you won’t be able to rent out the apartment over the garage unless it meets building code and passes inspection. Meeting building code is also very important if you plan to sell the house later. Creating a new space in your home can be an intimidating project. Taking the building and renovation process step by step simplifies it. These three larger categories help you break down what task needs to be tackled next to create a brand new apartment over your garage. The walls of your new apartment over the garage will define your space. If you want to add more privacy to some rooms of your loft apartment, you can add additional interior walls. If your garage loft is on the smaller side, an open floor plan with a private bathroom may be the way to go. You can build your wall with a simple wood frame that is secured into place with a floor plate and ceiling plate. Leave the frame open until you have installed all of your insulation. You can then finish it with drywall. Your windows can help take your new space from a bare bones garage loft to a beautiful living space. This is particularly important for smaller loft apartments that are limited in space. Large windows that fill your loft with natural light with minimal obstruction from interior walls will make your garage apartment feel much larger than it actually is. For a little extra room, you can replace any current windows with dormer window designs. 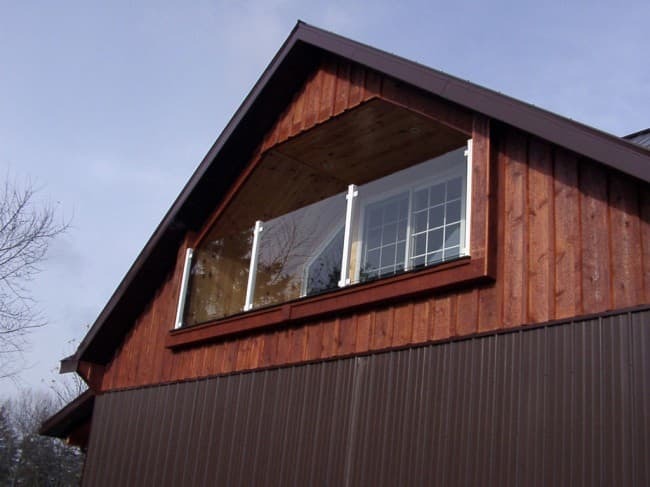 These windows extend out vertically from a sloped roof creating small unique design features both inside the loft and from the outside. Your ceiling slope may become a problem if it’s too steep. In order to meet building code, your garage loft apartment will need to have a certain amount of head room available. If you find that you need more head room in your loft, there are two solutions. You can either lower the floor of your loft and cut off some of the space in the garage below, or raise your ceiling and roofline. Both of these projects can be extensive and will require a high skill level. You want to ensure either of these changes are made safely and be structurally sound. The last decision you have to make is whether you want an interior entrance to loft above or keep it as an exterior entrance. A lot of this will depend on personal preference and how you plan to use the space. If the apartment over your garage is going to be for a family member and it’s already an attached garage, an interior entrance seems to make the most sense. However, if you plan to rent the apartment out, an exterior entrance may be a better fit for you. Your tenants will be able to come and go as they please without disrupting the main house. Don’t let your staircase hold up the renovation! Salter Spiral Stair provides prefabricated spiral stairs with fast shipment straight to your door and easy installation. A common problem that garage apartments have is temperature control. Because garages typically house cars, they are not built with effective insulation in mind. During the renovation process, you will need to add substantial insulation to your walls, floors, and ceiling. Spray foam insulation is a great way to control the temperature in the apartment above your garage. Not only does fill almost any crevice, but it also works as a sound proofing agent. This is ideal for apartments that are over garages that are still being used to house cars. Proper insulation and temperature control can significantly reduce the cost of your heating and cooling bills. If you’re building a completely new loft above your garage, you’ll need to ensure that basic utilities are in order. This will most likely be the most expensive part of building the apartment above your garage. An attached garage will have a little bit of an advantage when it comes to electric wiring and plumbing. Attached garages will already be on the same grid and system as the main house. This makes laying any new wiring or pipes for plumbing much easier and budget friendly. This will cut down on the installation cost, as well as the utility itself. Garage loft apartments have the extensive benefits of create square footage out of nothing. They keep your parking spot open for your car and still provide additional living space. With these raised space, you will always need some sort of staircase to access the apartment above your garage. The first stair design that any homeowner thinks of is a traditional straight staircase. These are typically found indoors in traditional style homes. They are typically all wood designs that have some customization in the spindles and decorations on the individual steps. You won’t have to worry about meeting building code with a traditional stair. They are usually designed to meet the safety standards. However, these building code compliant designs also have very large footprints that take up a lot of space. While this may work well indoors in a full size home, it may not be best for an apartment over a garage. If you want to have an exterior entrance to the apartment, you may find yourself replacing your all wood traditional staircase every few years. Just like an outdoor deck stair, all wood designs will have to go through a restoration process to ensure that they’re structurally sound. Spiral staircases are another popular option for a structurally sound means of access that will meet building code. Usually chosen for their small footprint, a spiral stair will only take up a small circle in or next to your garage. The diameter, or width of your stair, is what will determine the footprint of your stair. The minimum diameter of your stair to meet building code is 5’. This means that a stair that is building code compliant will only take up a 60” x 60” circle or square on the floor below. Your spiral staircase will hold up whether you plan to install it in the garage or as an exterior entrance. The interior options have a large range of materials available with a Classic Steel spiral stair, a Forged Iron spiral stair, and an All Wood design. The outdoor spiral stair lines are made to last with weather proof finish on our Exterior Galvanized and the maintenance free Powder Coated Aluminum spiral stair. Your spiral stair also has a larger flexibility when it comes to the access point in your loft apartment. A traditional staircase extends out in a straight line which can limit your access points. They are difficult to maneuver into a corner entrance. A spiral stair builds on top of itself making it easy to fit into a corner and out of the way of the rest of your garage or yard. Building an apartment over your garage has many benefits. Whether you’re looking to add extra income by renting it out or adding a new place for a family member in your home, you can definitely put this space to good use. 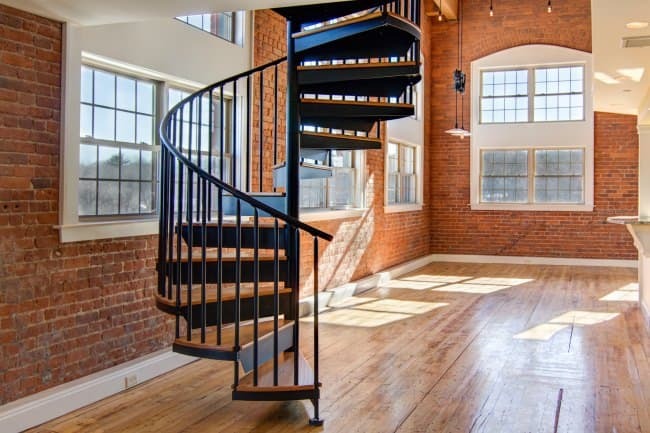 If you’ve found that a spiral stair is the perfect way to finish your new loft apartment, have a quick phone call with one of our consultative designers for pricing in five minutes or less.